Seaborgium is a chemical element. In the past, it has been named eka-tungsten but is now named seaborgium. It has the symbol Sg. It has the atomic number 106. Seaborgium is a radioactive element that does not exist in nature. It has to be made. The most stable isotope is 271Sg. Seaborgium-271 has a half-life of 2.4 minutes. What Seaborgium looks like is not known because not enough has been made to see it with human eyesight, but since it is in the same period as Tungsten in the periodic table, it's appearance and may be similar to such. 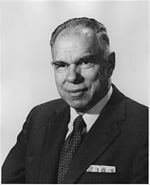 The element is named in honor of Glenn Seaborg. Seaborgium is a transuranium element. This means that it is "beyond" (trans) the element Uranium in the sequence of elements. Mendeleev predicted that Seaborgium would exist. He called the element eka-tungsten because of its location was near Tungsten in the Periodic Table. The chemistry of seaborgium is like the chemistry of tungsten. ↑ 2.0 2.1 Östlin, A.; Vitos, L. (2011). "First-principles calculation of the structural stability of 6d transition metals". Physical Review B 84 (11). doi:10.1103/PhysRevB.84.113104. ↑ 3.0 3.1 Fricke, Burkhard (1975). "Superheavy elements: a prediction of their chemical and physical properties". Recent Impact of Physics on Inorganic Chemistry 21: 89–144. doi:10.1007/BFb0116498. https://www.researchgate.net/publication/225672062_Superheavy_elements_a_prediction_of_their_chemical_and_physical_properties. Retrieved 4 October 2013. ↑ "Periodic Table, Seaborgium". Royal Chemical Society. Retrieved 20 February 2017. This page was last changed on 15 January 2019, at 08:42.